There are a few popular recurring arguments against environmentalism in general, and one of the most common is that only richer countries can afford to be green. The environment is fairly low on the list of people’s priorities, well after a stable income, basic housing and energy and so on. It’s only as countries develop and citizens enjoy a higher standard of living that they start to demand ‘post-materialist needs’ such as clean air. And by the time they do, the money is there to do something about it. This gives us an Environmental Kuznets Curve (EKC), derived from Simon Kuznet’s work on inequality in the 1950s. In the early stages of industrialization, pollution and environmental damage will rise sharply. As GDP increases, it will eventually peak and begin to fall, as governments begin to legislate for pollution controls and as the economy moves towards services rather than industry. The joy of the Kuznets Curve theory is that the environment is really nothing to worry about. It will solve itself if we just get on with pursuing economic growth. In fact, it turns the usual green concerns on their heads: those banging the drum for GDP growth are those who care most for the environment, because greater wealth will actually lead to better environmental performance. It’s a theory certainly has an intuitive appeal, and it would be convenient if it worked. So what’s the evidence in the real world? The initial observations for the Environmental Kuznets Curve came from modelling air quality in the early 90s. Across dozens of countries, a clear relationship could be demonstrated between GDP and pollution. Countries were indeed transitioning beyond heavy industry and as they did so, sulphur dioxide emissions and soot levels were falling. Tipping points in per capita income could be identified. Further studies showed improvements in water pollution too, though not across every indicator. However, studies on other environmental indicators found no evidence of a peak and decline. Deforestation didn’t seem to show signs of recovery, and biodiversity loss was not reversed. Municipal waste carries on increasing with income. Most importantly of all, carbon emissions didn’t peak and decline either. In ecological footprint terms, the wealthiest countries clearly consume more of the world’s resources and services than poorer countries. So the first problem is that the curve theory doesn’t hold across all environmental problems. It doesn’t apply to the most serious issue of our time, climate change. Of course, proponents of the curve simply say that carbon emissions do have a peak at which they would start declining, and we just haven’t reached the required per capita income threshold – so perhaps just a little more economic growth is what we need. Since we’ve already overshot the safe limits and begun to destabilise the climate, one wonders how much faith we want to put in the theory. Given that there are tipping points that would throw the climate into unstoppable climate change, increasing emissions is a luxury we don’t have. The second problem is that the Environmental Kuznets Curve really only applies within countries. Britain’s economy has moved away from heavy industry, but we haven’t stopped using the goods of heavy industry – we still want to drive petrol-driven cars and build things out of cement. Our own mines have closed, but we still use vast quantities of tin and copper and iron from elsewhere. Our environmental impact has been displaced, not eliminated. “Countries may improve their decoupling performance most easily by outsourcing material-intensive extraction and processing to other countries and by importing concentrated products instead” says the UNEP. What’s more, the next country down the line will also displace its environmental impact in turn. The most polluting industries have moved to China in recent years, and as China develops they will move again – currently towards inland China, according to some observers, perhaps eventually to Africa. But again, China’s improved environment does not equate to a global environmental improvement, just as shifting of pollution from one part of the world to another. Yes, that’s an important one – reducing the impact on the incline side. That’s partly about sharing technology, and making sure that if developing countries have to be building heavy industry, they’re building the latest, cleanest plant they can. Ultimately what we have in the Environmental Kuznets Curve is an Air Pollution Kuznets Curve, and it ought to be referred to as such. Even water is more dubious, since dirty rivers take so long to recover and you may need deliberate intervention to clean them and re-introduce lost biodiversity. Airborne particulate pollution is cleared in the rain, so you can see results as soon as you stop polluting. As far as I’m aware it’s the only form of environmental damage that actually reflects the simple curve of the graph. I had mentioned water, because parallel to air pollution control strong water protection legislation was introduced in Germany, and within a decade or so smelly, fish less water bodies returned to living biotopes, and many rivers and lakes now are in a better state than at any other time over the past 150 years – even trout and salmon were re-introduced to the rivers. Indeed that took an effort and more time, but that merely skews the curve. In any case the curve reminds me too much of the beautiful curve shifting in undergrad micro-economics courses, where first you simplify reality into oblivion and then create a curve describing aspects of an imaginary world. Even many micro textbook constantly emphasize that nothing of that really describes the real world (i.e. perfect competition et al). 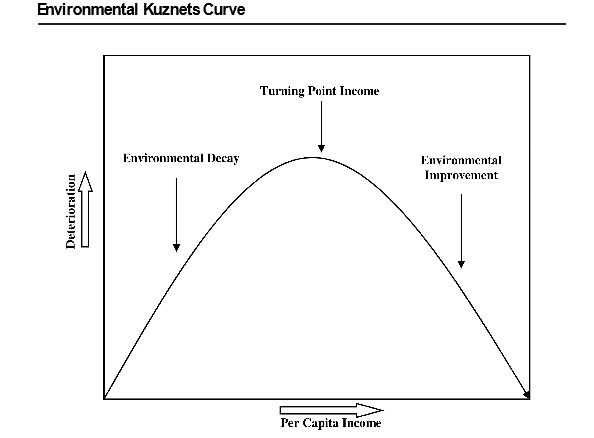 The Kuznets curve fits into this absurdity: moving pollution elsewhere, be it by moving production facilities or be it by building extremely high smoke stacks, or be it by filtering and dumping the poison elsewhere – is factored in as “environmental improvement”. Another part of the “logics”: environmental decay is a prerequisite for environmental improvement. Head-scratch. And another perspective: I had an interesting conversation with a lady today who works as a job counselor. She said that many people who worked in leadership positions are embarrassed and offended when they loose their job, their usually high income, and it takes a while of counseling until they re-define themselves in other than purely monetary terms and realize that their happiest times in life had hardly anything to do with money at all. For example for many Europeans or Americans life never gets much better than during college time, when nobody suffers from starvation or sleeps in the streets, but most live in very humble material circumstances: small rooms, shoestring budgets, that old, rusty bicycle… so the crucial question remains to me: why grow? Why work full-time when I can earn enough part-time to make a living, albeit in a more humble way? I suppose it is the crucial question of our era. Why are people happy when they are young at college with little? Because they have their future ahead of them. They are looking forward to growing in wealth and accomplishment. They feel very different if that small room, shoestring budget, and that old rusty bicycle were all they ever had to look forward to. That is why grow. It’s not fair to generalise. Maybe some were happy because they were looking to the future, but that’s not something I’d recommend in today’s job market for new graduates. I was happy at college because I was engaged in research that I found very stimulating, and I was part of an active and creative community of friends. Like Stefan, I choose to work part time and make less money, and am quite happy with that. I wouldn’t want to claim that it’s for everyone – it’s clearly not a life choice for those motivated by wealth and the accumulation of private possessions. The point is simply that the possibility of a fulfilled life doesn’t depend on money and possessions, and that a successful society is possible without endless growth. That unsupported statement is the key difference between us. Growth will continue while we have human ingenuity. If you think that is limited then growth will one day cease. I don’t. Oh – I even knew a tenured math professor who still only lived in a single room, despite owning the entire flat. He shared the flat with two catholic monks, invited students for tea and philosophical discussions – one of the most at-ease people I ever met. Worse still: when I lived in Hawaii I had a friend who was an economics professor of all things and had chose to live in a tiny cabin in the forests of Puna, on the Big Island. And the folks around me had a good time in college not because they were looking forward to a career. Admittedly they all are nerd types more interested in the subjects than in their careers. By and large they enjoyed doing what they were doing, meeting like-minded friends, having a relatively careless time with not much else bothering them than things they enjoyed being bothered by. Admittedly it was a bit different in the economics classes I also attended: quite a few students came to class with the BMWs, dressed up, made up as if going to board meetings and clearly set on track for a manager career, often as part of family traditions. I always felt sorry for them. It is true we here are parading our beliefs. I believe that human ingenuity is limitless. I can’t prove that (not having a time machine). Similarly you believe people would be happier living simpler lives. That too is a belief. I generally find people saying it is common knowledge find that there knowledge isn’t common or correct. Air pollution levels in Europe, certainly in Britain, have been improving since the 1960s. Well before we offshored manufacturing so you can’t rubbish the Kuznets curve there. Also Britain has more forest now than since 1750 and the amount is increasing. So as expected, in a richer country deforestation has been reversed. Hardly disproves it. Neither do your examples prove it. We know it applies to air pollution. The results on forest cover are mixed. In some countries there have been replanting schemes and reforestation is happening, and in others it isn’t and is unlikely to ever regain the losses. As for Britain’s cleaner air, that’s down to the clean air act. That was prompted by a health crisis in 1952, when the polluted fog was so thick and so pervasive that theatre goers walked out because they couldn’t see the stage. Nothing to do with offshoring, but hard to argue that it was down to increased wealth and post-materialist needs either. Being able to see and to breathe isn’t a luxury. The Clean Air Act was down to wealth. It is exactly evidence of the Kuznets curve. We had killer snogs before. We just chose not to do anything about them because we could not afford to and it wasn’t seen as anyones problem to deal with. They were just something we had to put up with. That is what the Kuznets curve is talking about. We got to a point of wealth that we were prepared to forgo a little of it to make a better enviornment. The level of wealth the UK was at in the early 1950s was just after what seems to be the inflection point on the Kuznets curve. So the Clean Air Act fits the curve perfectly. I’m not debating whether or not the Kuznets curve applies to air pollution. We know it does. My point is simply that when looking at the details of the clean air act, nobody was saying ‘we’re rich enough to clean the air now’. They were saying ‘my children can’t breathe’. Correlation does not imply causation, and you have to look at trends in technology and in human health and a bunch of other things to actually understand how environmental change happens. My point below covers that. Wealth is linked to being bothered enough that your children can’t breathe to forgo some of your wealth to do something about it. It is linked economically but also socially and politically. Wealth permits that extra societial organisation.Improving technology is also linked to increasing wealth. 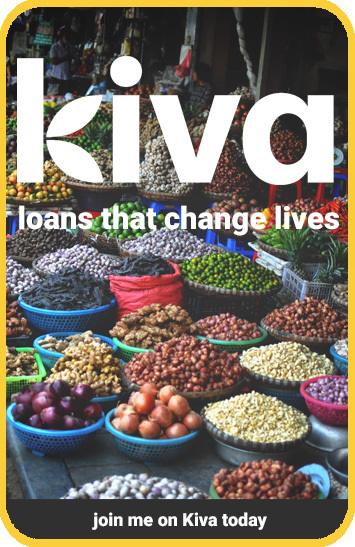 Carve it how you wish but you can’t get away from wealth being a vital ingredient for this. Reading Sherlock Holmes tells you that air pollution in London was a problem for decades. Why didn’t the Victorian’s fix it? Why didn’t they love their children as much? re forestation: to make a general rule out of that, you’d have to give more than one country as an example. The first sustainable forestry legislation in Germany was formulated in 1492 in Speyer, and in the 16th and 17th century sustainable forestry became the norm for all German territories. That changed by the way after the 2nd world war, although only in Eastern Germany, which was a rather inefficient centrally planned economy – but certainly it was infinitely richer than the country was in the 15th century. Wealth alone apparently is not the only issue. Neither was it in the case of Britains forests: without opening a history textbook, I suppose the “human ingenuity” you so much cherish for example played a role as well: wood for ship-building was replaced by steel, firewood for heating, cooking and commercial purposes replaced by coal and other fuels. I do not see how the Kuznets curve accounts for pretty mundane economic substitution effects. Ultimately it also became obvious, that environmentally destructive behavior is not economically sustainable. In the end a destroyed economy is more costly than environmental destruction. So long-term thinking (rather not a typical capitalistic trait) may play a role. Realization. Insight. Perhaps even a bit of wisdom. Does the Kuznets curve account for Wisdom and insight? I hope the EKC plays out in China soon as they are in serious danger of an environmental apocalypse (to say nothing of derailing their economic engine) due to the government’s policy in favor of unbridled if not unlimited pollution. Interestingly, China’s urban pollution levels are now similar to London’s in the 1950s, where it is seriously impeding everyday life – children sent home from school, construction projects forced to halt because crane operators can’t see, etc. And China is acting. There are serious pollution control attempts in the latest five year plan, including fuel efficiency rules for cars, electrification and so on. The Kuznets curve doesn’t just magically kick in though. There are always deliberate policy decisions involved, and a variety of factors that forces governments to act. If you’re looking for an economic connection, you can find one. But you could just as easily argue that environmental turning points come when risks to health and safety become critical. But of course that’s not nearly as useful to economists and growth advocates. This shows you don’t understand what the Kuznets curve is saying. For a country to be able to tackle environmental issues it needs lots of things to come together. It needs people to value what you want to fix higher than the costs to them of doing so. If you can scarcely scrape enough food together to stop your children from starving, then being asked to eat less so you can stop the smog is not a trade off you are prepared to make: You value the money you have to spend more than the problems the smog causes. Once the economy is providing enough food for everyone then forgoing an extra slice of bread is less of a sacrifice and you value your children not coughing up blood more. Economically advancing countries also make it easier for people to organise so that now they start to value clean air they can more effectively pressure the government to do something to solve the problem. Wealthier countries also can afford better organised and effective governments which are therefore better able to tackle those issues and impose necessary regulations. Those governments are also generally more responsive to public pressure. You notice that richer countries have stronger health and safety rules too. So saying it’s a health and safety issue is still fitting the environmental Kuznets curve model. China’s GDP per person is at about the level the UK was in the early 1950s, when we started being bothered by this. It is wealth that is the key to a developed country and developed countries value the environment. That is what the Kuznets curve is saying. You haven’t refuted it but I can see why you really want to. I’m not sure what you’re objecting to. I’m agreeing that China is at the critical moment to start seeing the Kuznets curve kick in. You’re trying to paint me into a more extreme position, as usual. I see the use of the Kuznets curve. The problem comes when people take a very general principle that only applies to a very narrow band of environmental problems, and then extrapolate it to make sweeping statements about how growth can be sustainable. The Kuznets curve doesn’t say anything about cause and effect relations. We see that within a certain range of wealth air pollution dropped. But is that to say that because enough wealth was accumulated people suddenly discovered their environmental consciousness? I find that hard to believe. I am not sure how it was with the UK in the fifties, but I remember Germany in the 80s, where we almost had a civil war. Croup and asthma were epidemic among children at the time, child mortality was at an unacceptable level in the industrial regions, COPD was commonplace among adults. I would offer the answer that the activities that gave rise to the wealth resulted in pollution, destruction and disease that became unbearable for the general population – and the related health-costs also were exploding. It was public political pressure that lead to legislation and air pollution standards – and not that extra money that somehow waited to be spent. If I am concerned the curve doesn’t prove anything. One of my math professors long ago reminded us not to confuse apparent statistical correlations with real world correlations, let alone cause and effect. The example he brought was the interesting statistical survey showing that the amount of lobster consumption among motor-cyclists seems to increase with the power of their bikes motors. What economics often does strikes me as akin to saying “eating more lobster makes your motorcycle stronger”. Am I mocking economics? I am not. Economists are doing that themselves. I don’t know how often I read in textbooks sentences like “the company does this and that, because this curve intersects that curve here and there” or “the market behaves in a certain way, because a certain curve slopes so and so.” I have severe difficulties taking any of that scientifically seriously, although there are some limited real-world applications. Economic game theory operates on a somewhat higher level, but still suffers from the garbage in, garbage out problem. A relatively recent introductory micro-economics textbook I know even constantly excuses itself for presenting ideas and concepts that have nothing to do with the real world. No economist I know has an attitude “the company does this and that, because this curve intersects that curve here and there”. Now student textbooks, because they are teaching, might exaggerate a point to make a direct connection that no real economist wouldn’t qualify, but the economics you see doesn’t bear relation to real economics. I guess because have a wrong conception of it is why you don’t think much of economics. Economics strives to describe describe many complex things. It is almost akin to climate science. A great complex interaction of many different things each hard to understand fully and even harder to quantify. Simple answers aren’t what economics produces. An unsupported statement about growth here, yes, but not in the context of this ongoing blog. I’ve presented plenty of evidence that infinite economic growth is incompatible with a stable climate. Incidentally, I believe human ingenuity is infinite too, which is why I’m confident we can go on innovating and improving well beyond the narrow definition of GDP as progress. Devonchap, you know as well as I do that what economists say and what politicians hear are different things. True, but I was taking Stefan up on his dismissal of of the subject of economics.